As many of you may already know, my brother David has been living with heart failure for almost 20 years. It has come to the point where his heart can no longer keep up with the demands of his body. At only 46 years old, David is now in advanced heart failure and has been told that his only chance at survival is to have a heart transplant. He was recently admitted to Tampa General Hospital and is currently receiving IV medication 24/7 to try and help his heart pump better to bridge the time from now until a transplant can be done. David is undergoing transplant evaluations now, but must initially raise $4,000 before he can be actively listed on the active transplant waiting list. This money will go towards his expensive anti-rejection medications that he will need to take for the rest of his life. Even with insurance, David will have this and other uninsured transplant-related expenses such as: co-pays and deductibles and continuing doctor visits and lab tests. He is counting on his family and friends to find it in their hearts to donate as much as they can afford. The sooner he is placed on the list, the sooner a transplant can be done. To help with this financial burden, a fundraising campaign in David’s honor has been established with HelpHOPELive, a trusted nonprofit organization that has been providing community-based fundraising guidance to patients and their families for more than 30 years. All donations are tax-deductible, are held by HelpHOPELive in the Southeast Heart Transplant Fund, and are administered by HelpHOPELive for transplant-related expenses only. Please consider making a contribution today by clicking the DONATE NOW button. DAVE HAS A DONOR HEART AND IS EXPECTED TO HAVE SURGERY TONIGHT AT 7:00 PM. HE IS IN TAMPA GENERAL AWAITING SURGERY!!! YOUR THOUGHTS AND PRAYERS ARE APPRECIATED!!! Dave had surgery on 11/4/15. He had two VADs (heart pumps) implated. The pumps are pumping the blood through his heart so his heart does not have to work. He is doing extremely well considering the severity of the surgery. He has begun physical therapy to regain his strength and is officially on the Heart Transplant List. He will remain hospitalized for another 2 weeks. Once he heals from the VAD surgery (apx 3 months) he will be an active heart recipient. Our deepest thanks to everyone that has been praying for Dave. He is such a strong person despite all he has been through. Dave was admitted to Tampa General on Thursday 10/21/15. His blood sodium got too low and they did a right heart catheterization. His heart failure has worsened and the IV medicine is no longer working enough. They have added a 2nd medicine to his IV for short term treatment. His doctors will be presenting his case to the medical review board so they can implant a LVAD (Left Ventricular Assist Device). The device will pump the blood for his heart, so his heart does not have to work so hard. The LVAD will be implanted as a bridge until a transplant becomes available. Please keep him in your thoughts and prayers. Dave is doing good at home with his IV Drip. He had a couple scares with the equipment, but overcame them. He is so strong. I can’t imagine how difficult life would be being hooked up to a IV constantly. Not only does he have to change the medicine bag every day and make sure there are no lapses, but he also has to live with all the restrictions of having the IV in. No swimming, no driving, etc. We are hopeful he will be put on the list soon. He is still going through the clearance procedures which should be resolved in the next couple months. Thank you again to everyone who has donated. It is so appreciated and we can’t thank you enough!! Today is Dave’s Birthday…he is 47!! Hello All. Dave is getting bored having to stay home with limited things he can do. So if anyone wants to send him an email and chat, you can send it to [email protected] He would love to hear from you. Dave wants to thank each and every person that has made a contribution. He could not have fulfilled the financial requirement of being on the transplant list without all of you. He is ever so grateful and one step closer to getting a new heart. The IV bag he needs to have is cumbersome and annoys him. He looks forward to being free of medical therapy and being able to enjoy life again. After more than 2 weeks, Dave was finally released from the hospital. He was able to go home with a port in his arm that an IV line is hooked up to. The medicine is stored in a fanny pack type bag that he wears around his waist. He was taught how to change the medicine and care for the port. He will have a nurse come to the house a few times a week and he will visit his doctor at least once a week to make sure the medicine is still effective. He will need to continue this until a transplant becomes available. Thank you so much to everyone for your donations and your prayers. It’s comforting to know he has so many people behind him. I can not thank you all enough! A special thank you to my mom and my aunt who both do so much for Dave. Love you both. 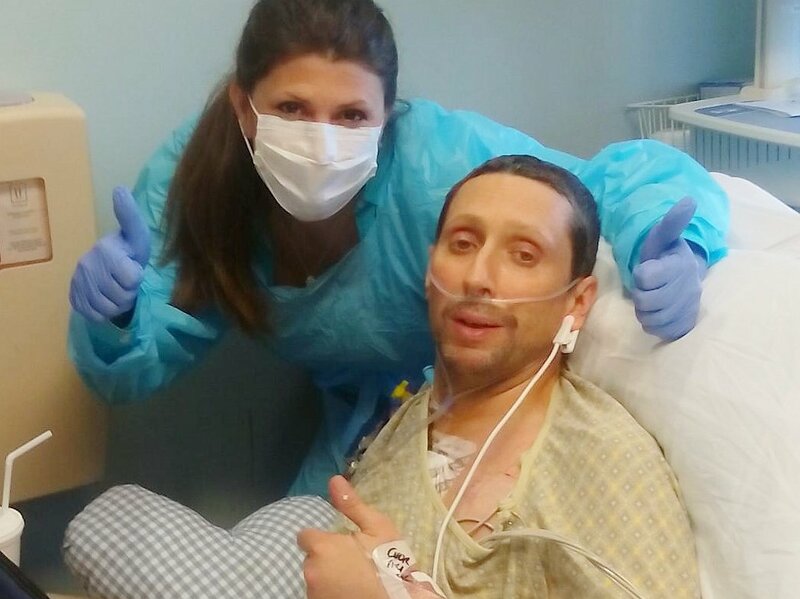 5/6/15 – Dave might be coming home today. He will continue on the 24/7 IV medication and will have to make weekly trips to see his doctor. Tomorrow, Dave’s doctor will be presenting his case to the medical board who will decide whether or not Dave will be placed on the active National Transplant List. His doctor does not anticipate any resistance, but please say prayers that he is accepted. Dave, I just made my donation to help you out. It seems as if all first born of our family have heart issues. Dave, You are my oldest brother and we have been through a lot. You have endured so much in your life and I admire you for your strength. I have no doubt you will overcome this and be stronger than ever. I will ALWAYS be here for you. Love you so much!! !